As we travel around we like to experience all the burgers of the world. So although this is not a Seattle burger, consider this one in a line of many future guest burgers. On a recent trip to the sticks of Texas I had the pleasure of hitting up Sengelmann Hall, a combination restaurant, czech bakery, dance hall, saloon, biergarten, and concert venue beautifully restored from its original 1890’s construction. 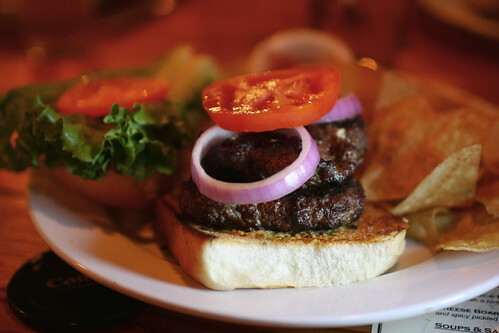 Their burger is described as a Fayette County beef burger on a house-made bun, with house-made pickles and mayo. Although not mentioned, it also comes with sweet red onion, beautiful tomatoes, real stone ground mustard, green leaf lettuce, and horseradish mayo. Sengelmann Hall is also a Czech bakery and it shows. This burger easily included one of the best hamburger buns I have had. Chewy and moist with a slight buttery sweetness brushed on top. Simply gorgeous. The vegetables were all lovely with the homemade pickles clearly standing out above the garden. However, the red onions were less than sweet and very over powering. I had to remove a few rings to restore balance and harmony. The horseradish mayo was interesting. For me, it mostly worked. Yes it was a bit strong. Yes it slightly overpowered other elements of the burger. And yes, I can definitely see a lot of people not digging it. Had it been a bit more evenly spread and maybe used a little less liberally, I think it could have tremendous. Then there was the beef. Very nice, as one should expect in a state full of cattle. A very clean tasting beef. It was nice. I would mention, however, that it definitely suffered from a bit too lean of a grind making it a bit dry midway through. I think it could have been slightly juicier and perhaps even a bit less seasoned. Otherwise is was legit. If you ever happen to find yourself in the sticks of Texas, I would definitely pay Sengelmann Hall a visit. A good burger at a very reasonable price, a beautiful building, legit history, and the staff was Texas wonderful.